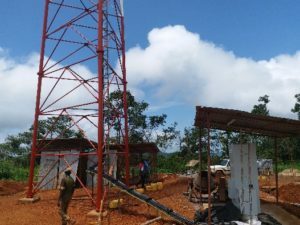 Da yu Mining has invested over one hundred and fifty thousand United States Dollars ($150,000) to construct the road leading to the hilltop where Africell constructed it network tower to provide coverage for villages in Simiria and Kafe chiefdoms in Tonkolil District, Northern Sierra Leone. This revelation was made to journalists by the company’s Community and Human Resource Consultant, Mohamed Sultan Daffae. He said the company has also engaged in road infrastructural development to connect villages around the mines. 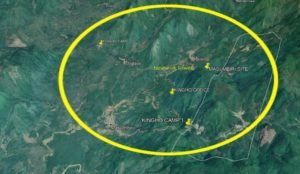 Da yu Mining which has a large-scale mining license located close to Masumbrie, Marandaand Kalmaron villages in Simira Chiefdom, is currently employing over 300 Sierra Leoneans to construct and develop a gold mine. In a very jubilant and joyful mood, residents of Masumbirie, Gbafaya, Maranda, Kalmaron and many other villages celebrated the historic moment of network coverage.The town chief of Mansumbirie, Pa SannaTholley said, “I am extremely happy that the long unimaginable dream has been achieved through Dayu Mining Company.”He said there was no network in over twenty villages in both Kafe and Simira Chiefdoms, since mobile telecommunication was first introduced in the Country in 2003. He said they used to either travel far distances or climb mountain tops and trees to make phone calls. The Chief commended Dayu management for providing jobs for his people and appealed that more jobs needed to be created as youth unemployment is high in the entire District. Identifying herself as a resident of Kalmaron village, MusuKargbo said she was impressed with the giant developmental strides undertaken by Da Yu mining company. She called on the Government of Sierra Leone to continue to provide the enabling environment so that genuine companies like Dayu will come and invest in the country.